SEBASTIAN – Florida’s native fish and wildlife are facing a serious threat posed by a variety of invasive species found throughout the state. The Florida Fish and Wildlife Conservation Commission (FWC) is taking steps to combat the introduction and spread of these non-native animals. Today, the Commission voted to approve a reorganization of rules related to non-native species. In addition, the Commission requested FWC Executive Director Eric Sutton and Vice Chairman Robert Spottswood to work on a temporary executive order to limit the importation of potentially high-risk injurious species. This will act as a stopgap measure while the staff develops proposed rules. “As we are in the process of rule development, we need an Executive Order in place to take the pressure off until we are ready to take the final action,” Spottswood told Sebastian Daily. Invasive species are animals not native to Florida that cause economic or environmental harm or pose a threat to human safety. More than 500 non-native species have been reported in Florida. Eighty percent of these have been introduced via the live animal trade with over 120 established in Florida, meaning they are reproducing in the wild. Most non-native fish and wildlife find their way into Florida’s habitats through escape or release from the live animal trade. Therefore, regulation is an essential component to prevent non-native species from taking hold in Florida’s environment. The FWC also encourages the public to safely remove non-native invasive species from the wild when possible. Non-native species are not protected, except by anti-cruelty law, and can be humanely killed on private lands at any time with landowner permission ­no permit required. 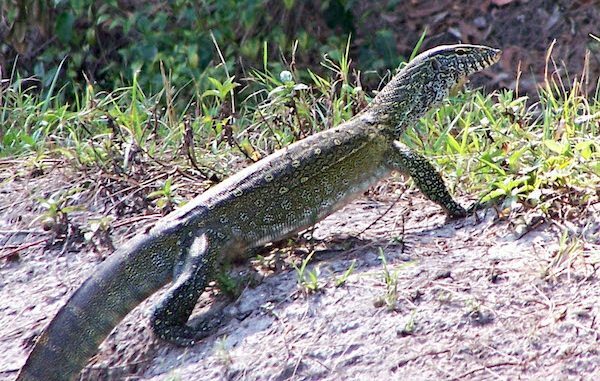 People may also lethally remove non-native reptiles from 22 FWC-managed public lands without a license or permit. For more information, visit FWC’s Non-native Species in Florida website.